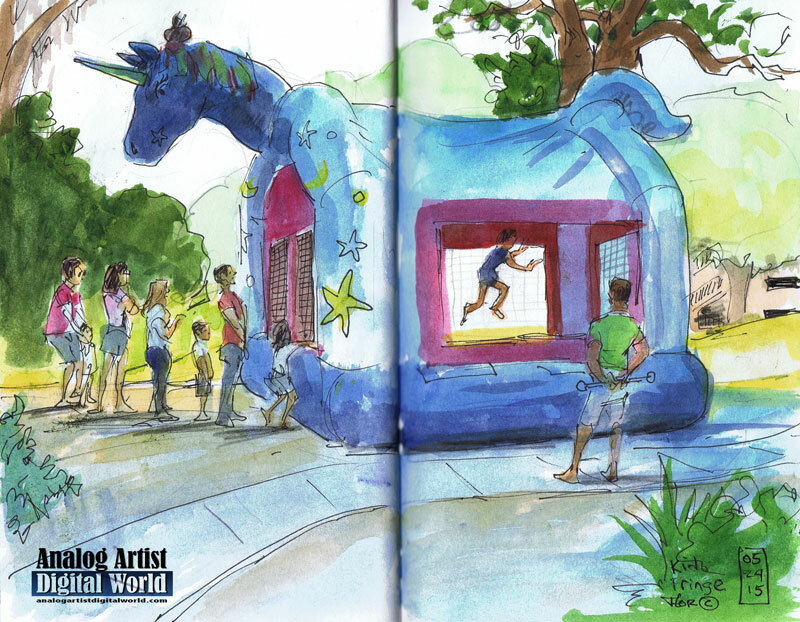 Analog Artist Digital World: Of course the Kids Fringe had a Unicorn Bounce House. Of course the Kids Fringe had a Unicorn Bounce House. On each morning of the Fringe Sketch Tour, we would start at Kids Fringe, warming up by sketching the kids stretching under the supervision of a Voci Dancer. After that, we would start the hunt for another subject. This Unicorn Bounce House was in the shade of a huge Live Oak Tree. There was always a line of parents escorting their children to the entrance. Oddly the Unicorn had a sand bag on her head. At first I thought it might be an icepack since the Unicorn might have partied too hard the night before. If that was the case, then having those children bouncing inside couldn't have helped her unsettled stomach. I did this sketch to demonstrate the idea of covering the sketch with as few large washes as possible. The Unicorn and all of the foreground was covered with a blue wash for shadows and the local color of the bounce house. I encouraged Gay to leave the lightest areas at the window where you see a child bouncing and around the Unicorn's head. The eye is attracted to the areas where there is the most contrast. I put a yellow band across the middle of the sketch to symbolize bright sunlight. Distant trees were treated with the lightest blue-green wash to imply aerial perspective. I also taught Gay to remove objects that over complicated the scene. For instance there were branches and moss directly behind the unicorn's head, but I removed those in the sketch to give the Unicorn head a clean silhouette.